It's easy to do your own home networking, if you want to run your cables in your walls you're going to need the tools shown in the left picture. Of course for the cable you need to run it down first in your walls, I only use that short cable for this tutorial. Words of note, do not cut your cables too short when terminating them to the modular jacks. In case you need to change the jacks later or you terminate them wrong then you don't have to worry having too short cables. Strip your cable jacket using the cable stripper. 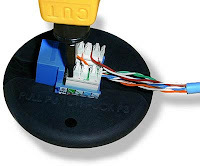 Prepare your modular jack, you can see the jack has printed color codes for terminating the UTP cable. It is really up to you which color codes you choose for terminating the cables, the important thing is to keep it uniform in your project. Personally I like to use the T568B color codes for my projects. Position your cable and the jack like the following position, and arrange the cables according to the color codes you'd like to use. Now it's time to use the Punch Down Impact Tool, if you look closely at the tool, you'd see different tips at it, you have to remember to position the sharp tip on the outer side of the jack. This tool has two functions, first it push the cables in to the slots on the jack, and the sharp tip is used to cut the excess cables. As its name, the tool would have an impact when used, so you might want to put the jack on the floor and put something beneath it like carton or anything else to reduce the impact of the tool. In a project where you have to terminate many jacks, it would just hurt your hand or back to terminate these things, you can use tools such as this EZ Grip Puck. On the left is the result when you finish using the punch down impact tool. This is not recommended but if you don't have impact tools, you can use anything that has slim shape to insert cables into the slots of the jack and then you can use scissors or cutters to cut the excess cables. Prepare your wallplate, you can see on the backside of it, it has a place where you can plug your jack.